Citation Information: JCI Insight. 2016;1(5):e85922. https://doi.org/10.1172/jci.insight.85922. Rheumatoid arthritis (RA) is a debilitating disease characterized by persistent accumulation of leukocytes within the articular cavity and synovial tissue. 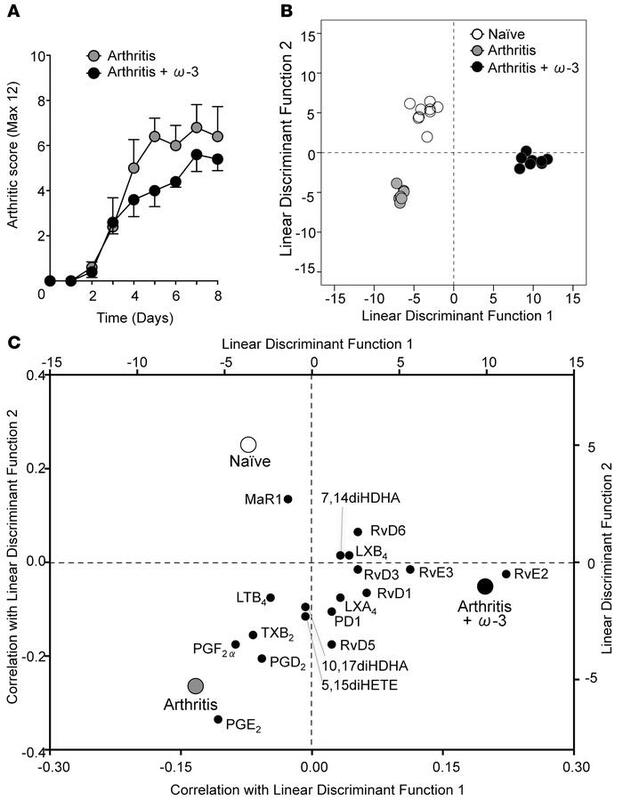 Metabololipidomic profiling of arthritic joints from omega-3 supplemented mice identified elevated levels of specialized proresolving lipid mediators (SPM) including resolvin D1 (RvD1). Profiling of human RA synovial fluid revealed physiological levels of RvD1, which — once applied to human neutrophils — attenuated chemotaxis. These results prompted analyses of the antiarthritic properties of RvD1 in a model of murine inflammatory arthritis. The stable epimer 17R-RvD1 (100 ng/day) significantly attenuated arthritis severity, cachexia, hind-paw edema, and paw leukocyte infiltration and shortened the remission interval. Metabololipidomic profiling in arthritic joints revealed 17R-RvD1 significantly reduced PGE2 biosynthesis, while increasing levels of protective SPM. Molecular analyses indicated that 17R-RvD1 enhanced expression of genes associated with cartilage matrix synthesis, and direct intraarticular treatment induced chondroprotection. Joint protective actions of 17R-RvD1 were abolished in RvD1 receptor–deficient mice termed ALX/fpr2/3–/–. These investigations open new therapeutic avenues for inflammatory joint diseases, providing mechanistic substance for the benefits of omega-3 supplementation in RA. Mice fed an omega-3–supplemented diet display reduced arthritis and a modulated local biosynthesis of bioactive lipids within arthritic joints. Mice fed a standard or omega-3–supplemented diet were given arthritogenic serum (100 μl, i.p. on days 0 and 2) and (A) arthritic score was evaluated. (B) Arthritic paws were collected for metabololipidomics analysis on day 8. Linear discriminant analysis was used to generate 2 discriminant functions from the values of bioactive lipid mediators (as quantified by LC-MS/MS), which maximize the difference between naive, arthritis, and arthritis + omega-3 treatment groups. Each datum corresponds to an individual mouse. The model achieves complete discrimination of the 3 groups. (C) Correlations of each lipid mediator with the 2 linear discriminant functions are shown on the bottom x and left y axes. Group centroids for the 2 discriminant functions are plotted on the top x and right y axes to show the directionality and association of each lipid with the 3 treatment groups. n = 7–9 mice per group.